Xi Jinping has said China's friendship with Russia guarantees "strategic balance and peace" in the world, on the second day of his trip to Moscow. 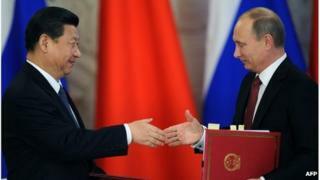 Mr Xi, on his first official overseas trip as leader, has already met President Vladimir Putin. He described the Russian leader as a "good friend". On Friday, Russia's state-owned energy firm Rosneft agreed to triple oil supplies to China in return for a $2bn (£1.3bn) loan. The two countries also agreed a preliminary deal for a gas pipeline to be built, although analysts say they are still a long way from agreeing terms. Russia is one of the world's biggest energy producers, and China is the world's top energy consumer. Bilateral trade reached a record $88bn last year, but the figure is still a fraction of China's trade with the EU and the US. In recent years, the two nations have also been closely aligned on global political issues. They have vetoed attempts by other members of the UN Security Council to authorise tougher action against Syria's government. And they have been largely in agreement over North Korea's nuclear programme. Mr Xi told students at the Moscow State Institute of International Relations that China would continue to oppose interference in the internal affairs of other countries. "We must respect the right of each country in the world to independently choose its path of development," he said. "Strong high-level Chinese-Russian ties not only meet our interests, but serve as an important, reliable guarantee of international strategic balance and peace." During the Cold War the two countries, while both nominally Communist, were bitter rivals. But both sides have been full of praise for each other during Mr Xi's visit. "We can already say this is a historic visit with positive results," Mr Putin said. Mr Xi was confirmed as China's president last week, concluding a lengthy transition process that saw him assume the Communist Party leadership in November 2012. Commentators say he is much more charismatic than his predecessor, Hu Jintao. On the first day of his trip to Russia, Mr Xi stepped off the plane with his wife, well-known singer Peng Liyuan. Ms Peng's appearance was widely reported in China's state media, and caused an outpouring of debate on microblogs. One message on the Sina Weibo website said: "China's quest for a graceful first lady is over."